A large cabin in the Smoky Mountains is perfect for a winter getaway with the whole gang! Our big vacation rentals are ideal for family reunions, gathering with old friends, or any type of group get together. President’s Day and Valentine’s Day are always popular times to schedule winter getaways. Of course, you have to consider the schedules of potential guests. It’s best to give people as much notice as possible, so they can make plans. You’ll have to make some calls or send emails to find the dates that work best for everyone. Our big Smoky Mountain cabins are equipped with all of the conveniences and luxury amenities you need for an incredible winter vacation. You’ll want to choose a cabin that is the appropriate size for your group. We offer everything from 4 bedroom cabins to 16 bedroom cabins in the Smoky Mountains. This makes it possible to house groups as large as 74 people! Cabins are designed to accommodate a diverse group, including kids and older folks. Many cabins have activities that are fun for children, such as game rooms. You can also browse our cabins and select one that has the location and views that you prefer. When you rent a large cabin in the Smoky Mountains, you are close to all of the excellent attractions for which the region is famous. One of the advantages of scheduling your vacation in winter is that it’s less crowded. You can visit popular attractions such as Ripley’s Aquarium of the Smokies, the Ole Smoky Moonshine Distillery, Ober Gatlinburg, and many more without having to deal with lines or traffic. There are plenty of things to do both day and night. The area has many great restaurants, as well as dinner theaters such as Dixie Stampede and the Lumberjack Feud. There’s enough to do around here that you can always split up when you have a large group. Some people might prefer to stay in the cabin while others might feel like going out. It’s also fun, however, to schedule some outings that include your whole party. That’s what a group vacation is all about! Many of our cabins provide incredible views of snow-capped mountains. You may also want to get out and enjoy some winter activities, such as hiking in the Great Smoky Mountains National Park or skiing at Ober Gatlinburg. Temperatures during the day are comfortable, making it fun to explore the area. You’ll find that it’s enjoyable to walk around downtown Gatlinburg, either during the day or at night. Holiday light displays are kept up right through February, making the city especially picturesque in winter! As you can see, there is a virtually endless list of things to see and do in the Smokies. However, our big Smoky Mountain cabins also make it tempting to just stay in and enjoy the views and many activities. Lots of cabins are equipped with fireplaces, which provide an ideal backdrop for group meals, games, and conversations. 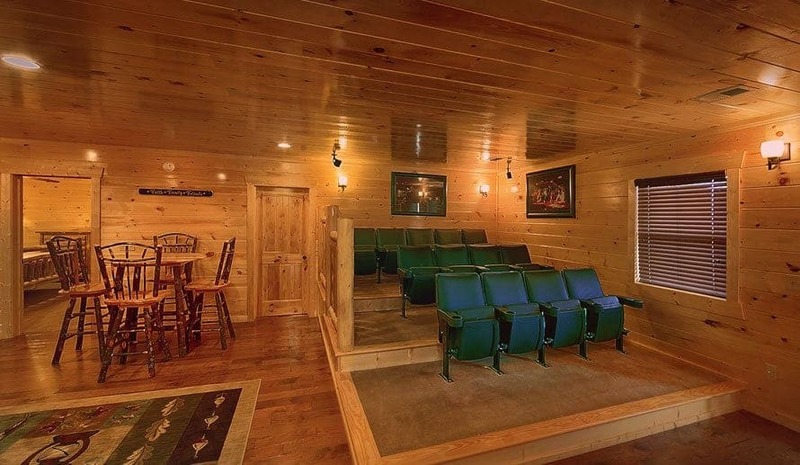 Cabins also have entertainment such as home theaters, satellite TV, pool tables, arcade games, and more. Of course, a vacation in the Smoky Mountains should also include plenty of downtime and relaxation. When you stay in one of our cabins, your group will have the perfect balance between activity and rest. To see our complete selection of properties, check out all of our large Smoky Mountain cabin rentals!